Welcome to Baan Paradise, a luxurious five bedroom villa located along a paradisiacal white sand beach. Wake up to uninterrupted views of the ocean, salty sea breezes and the sonorous sounds of the waves each morning during your stay. 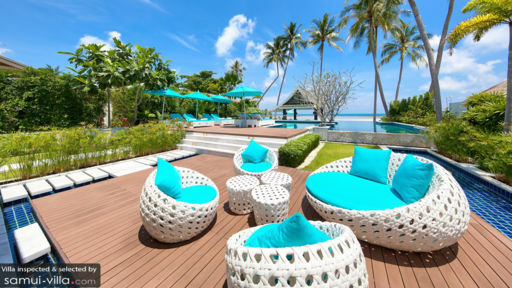 The coast is just a skip away, but if you’re in a lazy and leisurely vacation mood, Baan Paradise has everything that you’ll need - from sun-drenched outdoor spaces and finely appointed living areas, to a fully equipped gym and plush theatre - so you won’t have to take a single step out of your villa. Five bedrooms sleep ten guests at Baan Paradise. Floor-to-ceiling glass sliding doors allow ample sunlight to flood in, creating interiors that are bathed in natural light. The vibe is cosy and comfortable thanks to the soft cream hues, wood panel flooring and amber lighting. Each room comes fitted with a dressing room and private en suite. 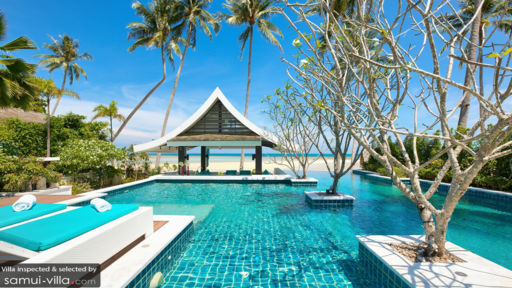 Make a splash in the expansive cobalt pool at Baan Paradise! Choose between taking a dip in the pool, or enjoying a soak in the bubbling jacuzzi tub. The spacious wooden deck comes fitted with loungers coloured in a bright turquoise hue, as well as outdoor furniture that comfortably accommodate guests keen on enjoying nibbles and libations by the poolside. A sleek sunken lounge offers pillowy seats and a comfy setting for enjoying your evening sundowners. Baan Paradise combines beachfront tropical living with state of the art amenities. This modern home is fully automated, so you’ll be able to control all facilities - from the AC and music, to curtains and lights - with the use of a handy smartphone app. If that’s not enough to leave you impressed, this tastefully decorated villas will wow you with its contemporary decor and commodious living spaces. Baan Paradise is a full-service property with housekeeping services, in-villa massages, personal guest services, security services, airport transfers, welcome drinks and a daily breakfast service. Amenities available at additional cost include vehicle rental, boat rental, laundry service and personal chef services. The villa provides family-friendly amenities. A baby cot is available for use free of charge, while professional child minders may be engaged at additional cost. Villa Baan Paradise is situated along Hua Thanon Beach in East Samui. This region of the island is quiet and laid back, and lends itself to holidaymakers looking to stay away from the tourist hotspots of Samui. The Muslim village of Hua Thanon boasts a charming atmosphere, and offers a glimpse into the traditional lifestyle of the locals before the island was developed as a tourist destination. You’ll find little else in the immediate vicinity apart from a few dining establishments. Yet, its sense of remoteness is precisely what draws vacationers towards East Samui. Bang Kao Beach, located 10 minutes’ drive from your villa offers an unspoilt and picturesque setting. Do note that the sea conditions here aren’t suitable for swimming. For a livelier beach ambience, take an 11-minute drive to Lamai Beach. It’s the most popular beach after Chaweng, so expect a vibrant crowd of beach-goers, as well as a varied dining and nightlife scene. There’s quite a lot to do within easy driving distance from your villa. Our recommendations include cooking classes at Lamai Thai Cooking School, yoga classes at Yoga House & Spa and massages and spa treatments at Tamarind Springs. Don’t miss out on exploring key cultural attractions in Lamai like the Hin Ta & Hin Ya Rocks or Pagoda Khao Chedi, or taking in panoramic hilltop vistas from Lamai Viewpoint.